Life in the fifth grade had been pretty rough for 10-year-old Mason Williams. He had been having trouble making friends and ate alone in the cafeteria every single day. But when Mason’s teachers noticed that he had nobody to sit with at lunch, they got together and did something truly wonderful: They went ahead and made him a janitor. It’s amazing to see a school that’s willing to support a lonely student! Mason’s teachers truly went above and beyond to reach out to him and help make his loneliness seem less weird by employing him full time to keep the school clean and to address any and all maintenance issues that are brought to his attention. 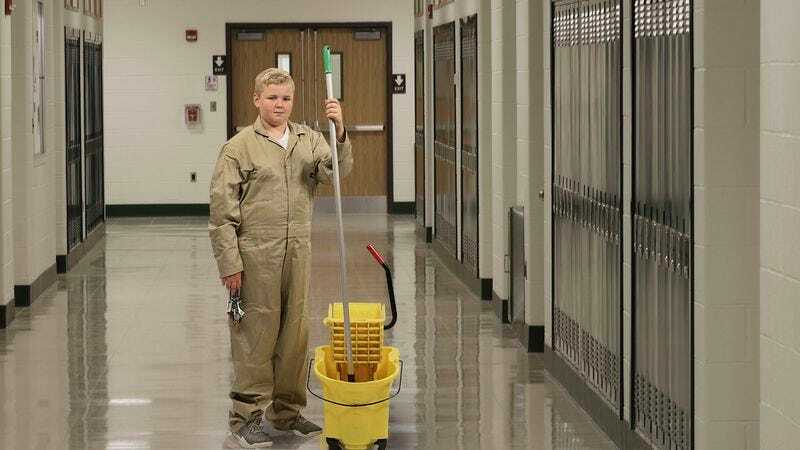 Being a janitor is a one-person job, so when people see Mason sweeping the school’s hallways, mopping floors, or cleaning up the spilled food of his former classmates, it no longer looks sad that he’s alone. It just looks like he’s doing his job! So there’s your dose of inspiration for the day. Mason is incredibly fortunate that he has such amazing teachers who not only recognized that he was feeling alone, but were even willing to come together and do something about it by making him a janitor. It’s yet another reminder of all the incredible things teachers do for their students every single day!